Fire Extinguisher training event held in Hostel-C on September 15, 2016. India – one of the primeval cultures on the planet and the global destination for business in the 21st century. From ancient to modern day management, Indian Values have always been the examples for the rest of the world. The world is seeing India as the land of opportunities. We are striving harder and faster towards becoming one of the super powers on the globe. But in order to achieve the desires we need to fight against few internal evils and corruption, being on top of that list, needs to be addressed and tackled with topmost priority. In order to create public awareness against corruption, the Central Vigilance Commission as the apex anti-corruption body of the country, observes Vigilance Awareness week every year. This year it is observed from 26th – 31st October with the theme of "Preventive Vigilance as a tool of Good Governance." 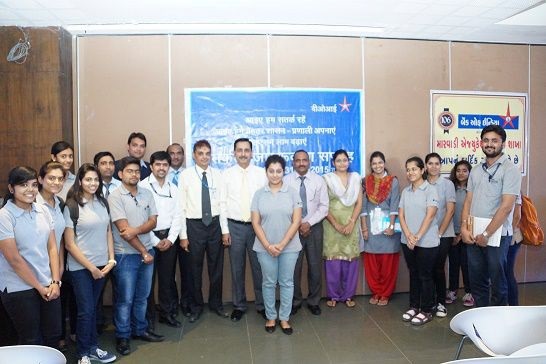 As a part of this week long celebration Bank of India and Faculty of Management - Marwadi Education Foundation’s Group of Institutions (MEFGI), Rajkot, jointly collaborated and organized an Elocution Contest for the Management students on 29th October, 2015. In this unique experiment more than 50 students from Management department from MEFGI shown the enthusiasm to contribute and compete in the initial screening and 14 contestants could make it to the finals.